This post contains spoilers! 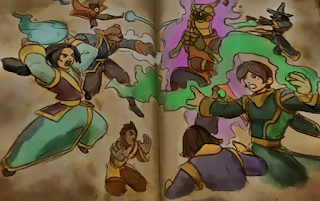 If you haven't completed Mirage's storyline, please read at your own discretion. Bartleby's health condition has dropped dramatically before we ventured into Polaris, and Merle Ambrose thought we might find answers to his illness there, but unfortunately we came back empty-handed. During our studies at the Arcanum, Librarian Fitzhume urges us to return to Wizard City and check on Bartleby. After traveling through the Spiral door to Ravenwood, we find that Grandfather Tree's condition has gotten worse and after having a word with him, he says he barely remembers us and mentions his lost eye, the Eye of History, which was stolen by the former Death Professor at Ravenwood, Malistaire Drake. Upon witnessing Bartleby's distress first-hand, we consult Headmaster Ambrose on the possible whereabouts of the Eye of History. He swiftly sends us on a trail that leads us to Malistaire's home, where we discover his personal notebook. After taking the manuscript, we are confronted by a familiar face who has gone rogue: Duncan Grimwater. The Death student informs us that in order to join a group of dark wizards, known as the Cabal, he has to prove himself by stopping us from taking Malistaire's journal. After Grimwater's failed attempt to halt us, we go back to Headmaster Ambrose's office and leave the journal in his care, so he can read it while we go back to the Arcanum. After reporting back to Ione Virga, the Storm Scholar, we discover that the Eye of History was indeed taken to Mirage and so a new journey begins for us. In Mirage, we find that each grain of sand of that very world is a moment in the Spiral's history. The reason for this is that Mirage is home to the Chronomancers, a group of Wizards who control and preserve the flow of time. Shortly after reuniting most faction Houses in Mirage, we discover that in order to slow us down, Grandfather Spider sent the Chronoshards to another dimension: the Astral Plane of the Djinn. With Istar's help, we manage to break into Eerem Palace and ultimately defeat Eerkala, a Dark Djinni who was working with Old Cob. We learn from her that Spider intends to use the Chronoshards to turn back time and erase the very existence of all beings in the Spiral. After traveling back to Wizard City, Headmaster Ambrose informs us of his suspicions that the initials "G" and "D" found in Malistaire's journal refer to Duncan Grimwater, so he asks us to confront him again. We find him at his house, but he claims to have been rejected by the secret organization, after his defeat at Malistaire's mansion. He inadvertently drops a hint that the double agent is in fact Gretta Darkkettle, an old witch who has taken residence in Firecat Alley, after resigning from Ravenwood. We eventually end up in the Cabal's secret headquarters in Wizard City and defeat Gretta, who warns us about the Arcanum's lack of honesty. We go back to the Arcanum and confront Ione with Gretta's accusations and she takes full responsibility, claiming that they wanted to make sure we weren't tainted by Shadow Magic, even saying that Velma von Venkman, the Shadow Scholar, wasn't trusted at first either. "Centuries ago, the first Scholars came together to study the Mysteries of Magic and the Secrets of the Spiral. Some among Scholars became convinced that the Spiral was doomed, and that restoring the FirstWorld was the only hope for the future. They knew countless lives would be lost, so they began building the "Arkanum" to protect a group of survivors they would select. But others among the Scholars opposed the dark plan. The two sides fought. The first group was defeated and exiled. They formed the Cabal. The other group of Scholars finished building what became the Arcanum, but used it instead as a base for their studies and experiments." In truth, the Cabal seeks to restore the FirstWorld, a plan that would destroy the Spiral and everything in it, so they joined forces with Grandfather Spider to carry out their goal. 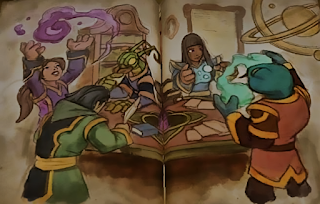 After returning to Mirage, we find out that a Cabal agent has infiltrated the Chronomancers order and reversed the Sands of Time, using the Chronoshards, and in order to safeguard the Spiral's future, we consult the Chronocle, who was entrusted the Secrets of Time by Grandmother Raven, for answers and guidance. 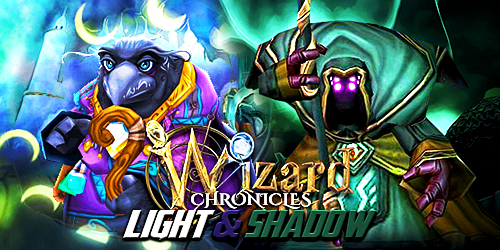 To be continued in "Wizard101 Chronicles: Rise of the Titans (Part 2)"!